Chapter 5: "Tide of Honor"
The heroes arrive in Minkai only to discover an empire on its knees. The Jade Regent has twisted the ruling government to cater to his despotic whims, and throughout the realm the people suffer. Before the PCs can attempt to stand against the tyrant and liberate Minkai, they must first earn the trust of its people and recruit aid from across the beleaguered empire—all the while dodging murderous oni and deadly ninjas controlled by the Five Storms. Defeating bandits who ride forth from a hidden fortress, rescuing a famous geisha from a deadly island prison, and standing tall before a corrupt daimyo’s army of samurai are all in a day’s work for the hopeful liberators of the empire. “Tide of Honor,” a Pathfinder RPG adventure for 12th-level characters, by Tito Leati. An overview of the mysterious nation of Minkai, a mystical jewel of the Dragon Empires, by Tito Leati. Revelations on the ways of Irori, god of history, knowledge, and selfperfection, by Sean K Reynolds. Revelations and severed limbs in the Pathfinder’s Journal, by Dave Gross. Five new monsters by Tito Leati, Sean K Reynolds, and Mike Welham. Tide of Honor is sanctioned for use in Pathfinder Society Organized Play. The rules for running this Adventure Path and Chronicle sheet are available as a free download (532 KB zip/PDF). Just finished running recently great sandbox adventure with a wide mix of rp puzzles combat and establishing the land of Minkai be sure to read the empty throne before running this as the fm should introduce info in this adventure so it doesn't come out of left field. Lastly Tito needs to write more adventures! Going into Jade Regent, I was looking forward to this book the most. Finally arriving in Minkai with your goal close in hand, yet still far off and with plenty to do was exciting. After reading through it though, I found this volume lacking. First of all, I don't think I can talk about this volume without mentioning the next installment as well. In The Empty Throne there are two characters introduced that play a significant part in the final battle. These characters are not mentioned at ALL in this book. What's more, is that the next book goes into details about how players can learn about these characters from NPC's in Tide of Honor. This is a glaring disappointment, and this should have been written into the book instead of a sentence or two mentioned in the final book. Aside from that, I also found an issue with the "down time" between sections of the book. PC's are spending hours and even days traveling from one place to another, and the only thing you are given to help with the grind is a large random encounter chart in the back. This is a country that is suppose to be in turmoil. The people are being oppressed and need the PC's and their allies to save them; but all we get is a single sentence saying the people are being oppressed. This is a huge disappointment in my eyes. It really forces the GM to come up with all of this information and planning, even though a lot of it should be in the book already. This volume does have it's strong points. The dungeons and encounters are all well thought out, and thematic. The characters you interact with are strong, believable characters. But the time between those character interactions and dungeons are what hold this volume back. If you are a GM and are thinking about running this volume, be prepared to do a lot more work than normal to make this into an enjoyable experience for your players. You can read my full-length review on my blog. In Tide of Honor by Tito Leati, the fifth instalment of the Jade Regent Adventure Path, the PCs finally arrive in Minkai, the country of their destination. There they need to begin gathering allies to help them overthrow the Jade Regent and place the rightful heir, Ameiko, on the Jade Throne. Tide of Honor is something of a change in style for the adventure path. What has been primarily a journey from one point to another now starts to set up a home base. Instead of fighting clearly defined enemies blocking their way, the PCs must now engage in a significant amount of diplomacy to win the trust and assistance of people who might be willing to help them, or might not. There are still obvious enemies to fight, but there are also a number of people who could go either way or just remain neutral. There’s a great deal of roleplaying potential in the adventure, more so than any of the previous instalments (with the possible exception of Night of Frozen Shadows), and for groups who prefer that sort of thing, I think this adventure has the potential to be one of the most enjoyable and memorable of the entire adventure path. However, for groups who prefer a more combat-oriented approach, there’s still lots to keep them happy, and GMs can easily gloss over the diplomacy stuff in such cases. Very interestingly decorated old hat. 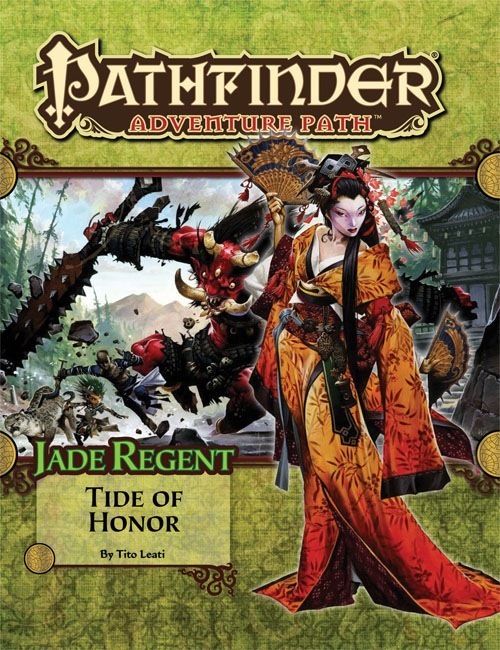 The number one thing to say about Tide of Honor is that it is one of the best classic modules that Paizo has done in a long time, dressed up and made as Japanese as possible. Does it cover new ground? Not at all. Is it fun to read, well-written and engaging? Absolutely. My definition of a classic module includes puzzles, riddles, fighting evil sorcerers, dungeon crawling, fighting bandits, and saving princesses. This book has all of that. One of the only Paizo books to have a riddle, a 3-D item puzzle AND an honest to God maze that works even if you play Pathfinder 100% on-the-grid, Tide of Honor has a lot of good non-combat content for the downtrodden roleplay-lovers who spent the majority of Hungry Storm rolling up random encounter after random encounter. There's diplomacy, investigation, and "scenario dungeons"-- a phrase I'll use here to describe a collection of encounters your middle-high level PCs can hit any way they like, instead of the more formulaic dungeons where the PCs are expected to go through room A1 to get to A2, and A3 to get to A4. Oh, and there are formulaic dungeons too. Something for everyone (except for people who hate table-top games). Encounter variation is extremely good. The module runs the gamut from martial to mystical encounters and even includes a puzzle encounter, something I thought was interesting. I especially enjoyed one encounter which the DM can employ against the PCs any way he would like, and the advice presented in executing this encounter stashed away in the Appendix. The art in the book is very well done. No pieces seem lackluster, and all of them pop and depict their subjects very well. I am slowly falling in love with whomever does the pastel artwork for Paizo-- not in love enough to look up their name right now, but, seriously, they're amazing. As far as what to look for, if your PCs enjoyed A History of Ashes, Tide of Honor has similar subject material-- Do all of these things so that you can gain enough pull to begin doing this thing, and also you are in a completely new culture that is foreign to you. If you're looking for a completely classic adventure module, Tide of Honor is the closest you're getting until Shattered Star. The cover image is a mockup, and will change prior to publication. Ninja, Samurai, and Oni Oh my. Welcome back Tito. I am sure this adventure will rock. What does "extensive gazetteer" mean? Is it double-length like in Hungry Storm? It's not double length. "Extensive" means several pages, as opposed to one or two pages like what you get in the Inner Sea World Guide for every region. How many pages, I can't say for sure. Probably 8. This volume ALSO has a deity article in it, in any event, so it's a plain old normal ratio of support articles for this one. Looking forward to the Irori article, I expect the planar allies will be interesting. BTW, the Paizo spellchecker programs should have "daimyo" added to the word list so that "damyio" does not get through again. This adventure seems like a logical place to try out the performance combat rules. Did they make it into the AP? Soooo any idea when the cover for this one will be updated? OOoooooh! Nice cover! I am already in love with the geisha... I hope she gets a romance score! Nice looking Geisha but she does look a little sinister looking as well. Love the pic of the Oni in the background as well. Whozat? The imprisoned-island-geisha from the blurb, or somebody else we've already met? She's the imprisoned island geisha. And I could be wrong, but I'm pretty sure she doesn't have a romance score—we're approaching the end game here, and there's NO TIME FOR LOVE! "No time for love, Doctor Jones!" we're approaching the end game here, and there's NO TIME FOR LOVE! Every good movie climax needs that terrible reveal from the love interest that leads to the heartbreak/sexualtension and threatens the hero's resolve as he tries to take down his sworn enemy! Or this just goes in a bin of "quotes from JJ to use and abuse"
EDIT: I've been ninja-ed by the Gninja! Wow the Geisha is just stunning! Would love to see her become an Iconic character & especially get a miniature. Any chance the Tide Of Honor cover will also a desktop photo for it? Any idea as to when this AP will be shipped out this month? I am guessing the week of the 19th, thereby receiving an email the week of the 12th, but I want to be sure how much agony I will have to endure in waiting with anticipation for this AP installment. Good stuff guys!! But what about after? I mean, there should always be a time after the adventure - I know, she would understand. Any idea as to when this AP will be shipped out this month? It got pushed back to January. Four more weeks of agonized anticipation I'm afraid. I wonder why it got delayed? Haven't there like 5 storms been reported on the west coast? Doubt that's the issue. All the other books for December actually moved up a week. My guess is Tide of Honor was holding them back for whatever reason. Regardless, this happened last year with Serpent's Skull, so I was sort of expecting it. Thanks for the information GV. I wonder if we will remain one month behind or play catch up at the end? On the plus side if one ever did sink you might have a whole new school of fans, as fish start subscribing.... though you might need to water proof your books. That's a reason to hate waiting! If it has to be January how about both parts 5 & 6 in January? I'd say the most likely explanation is them bumping their schedule around to arrange their work around Chinese New Year, aka Tet, and the ten days preceding it, which falls on January 23 next year. It's a pretty big travel season over there, and like the Christmas to New Year's run, people want the time off then. Check out chunyun, the world's largest human migration. Basically, all China grinds to a halt as the rail system is packed moving people. It's so bad that last year or the year before, places almost ran out of coal because the railways couldn't keep up with the traffic. My paranoia can't be something that drives business decisions. I'd always wondered why that line of Paizo tinfoil hats had been pulled. Unfortunately, due to a delay in shipment from the printer, Pathfinder Adventure Path #53: Tide of Horror (Jade Regent 5 of 6) is now estimated to be released in January 2012. And I was going WTF? has the piraty-thingy already started? That Oni on the front cover is that a Yai? Too much Call of Cthulhu? It is! A fire yai, to be exact. Yes. All subscriber PDFs are granted when your order ships. So, any performance combat duels to win hearts & minds? Wow. Not only is it delayed, it's delayed until at least the 20th of next month for subscribers. That's pretty rough business-- Nov 7th to Jan 20th seems pretty long. Thank god we're dragging our feet in our Jade Regent game. Luckily my gamers found my old 1st edition against the giants modules and are champing at the bit to get nine ironed into the next county by a fire giant. Come now! There's always time enough for love. Perhaps we could have another blog post detailing the romance and friendship options for important NPCs, for those interested in the inevitable article "after Jade Regent" gameplay? So anyone got there PDF copy and had a look at it yet? In case any lurkers were wondering about my question, a quick pass with C-f for "duel" only found ads, and "performance" only turned up bard references. Also, "daimyo" appears but "damyio" does not. Can't wait to dig into the text! Watch out, the earth yai's summons go to 11! Although given what happens to drummers, perhaps this is only fair. So what are the monsters in it's bestairy?